Day 1: Arrive into either Dublin or Shannon Airport. Enjoy chauffeur driven private transfers to the 4-star International Hotel in Killarney. Evening will be at your leisure to relax and unwind. Day 2: Today you and your group will golf Waterville. 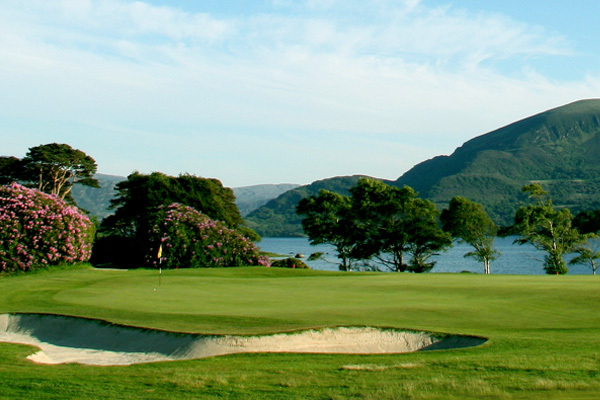 Waterville has recently been upgraded by Tom Fazio and is ranked in the top 5 of courses in Ireland by Golf Digest. In advance of your first links outing, we will provide a special 1-hour instruction with a PGA professional to guide you on your links adventure. Day 3: Heading slightly north from Killarney, today you will play Ballybunion's, Cashen Course. The Cashen course is a links course and part of the world-famous 36 holes located at Ballybunion, lauded by Tom Watson and others. Day 5: Today you will stay local and take a break from Links golf. Enjoy your tee time at Killarney at Killeen Course. Located just outside of town and set among the Lakes of Killarney, one of Ireland's finest parklands with majestic scenery. This course also hosted The Irish Open in the past. Day 6: Your last tee time of the week will be at the Old Head Kinsale located in County Cork! World famous as probably one of the most iconic and scenic courses in the world, you won't want to leave. Day 7: Your transfer will take you to the airport for your departure home. Please fill out the following form to request finalize your Ireland Golf quote. We will contact you via the phone number and/or e-mail address you specified in the form.